The MOMA in NYC is presenting an exhibition of work from their permanent collection, featuring abstract work produced by women between 1945-1968. Although abstraction was an important genre of art during this time period, the work created by women has been underappreciated. There is a wide range of art on display from gestural expressive paintings and drawings to the more geometric and calculated. 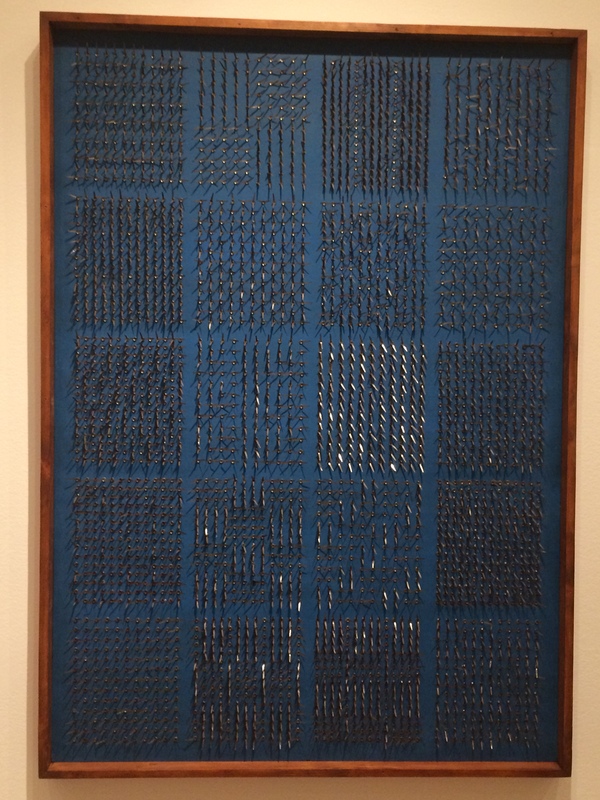 For this assemblage “Five by Four”, Běla Kolářová used metal paper fasteners to count out the grid patterns that make up each of the 20 rectangles. These rectangles are then arranged in 4 columns, 5 rectangles high. The use of the paper fasteners (something found in any home or office) as a mark making vehicle adds extra personal element to the work. This large scale canvas by Carmen Herrera features two isosceles triangles with their bases along the top of the painting. 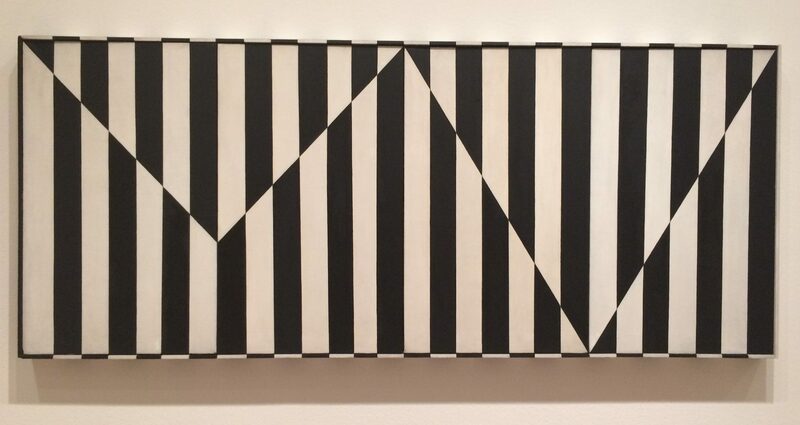 Using the tension of black and white vertical parallel stripes, Herrera has defined the shapes by swapping the colors at the sides of the triangles. 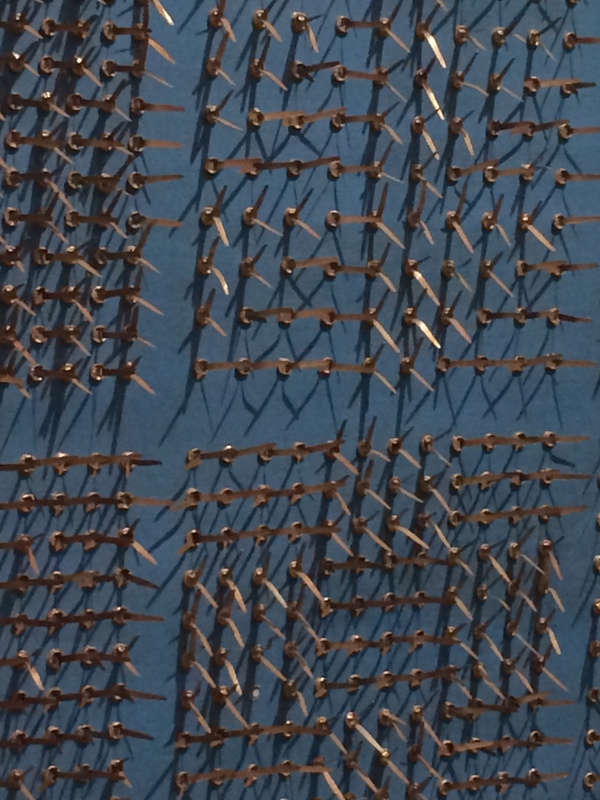 This technique has created an visual energy along these lines that allows the triangles to pulsate. The geometry of this painting is so strong, you feel like you are being pushed back to view from a distance.